Realme republic day sale. Win free cash up to 1000. Wallet amount Valid on all products in Realme website. Win Free Realme U1 & Earbuds From Realme Republic Lucky Bag. 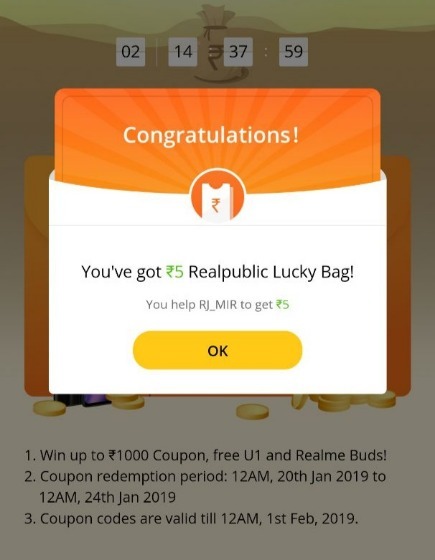 Realme Republic Lucky Bag, Realme Republic Day Sale, Realme Republic Lucky Bag Price Drop. Every participant can win default ₹100 in his/her Realpublic Lucky Bag and increase the value by sharing the game to friends and family i.e. on referral basis, others can also get their Realpublic Lucky Bag value increased after login to or register Realme account. Realpublic Lucky Bag will increase by a random value between ₹5 and ₹50. 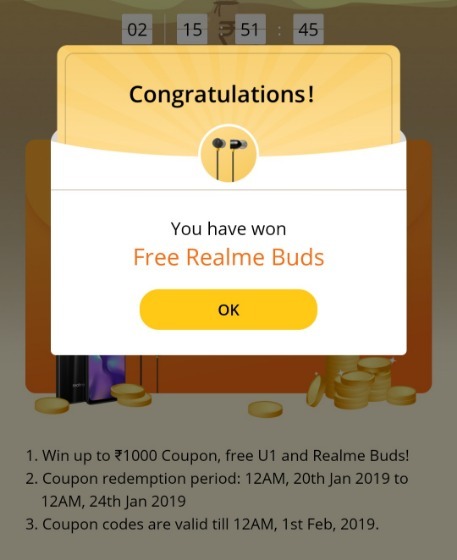 Win up to ₹1000 Coupon, free U1 and Realme Buds! Coupon codes are valid till 12AM, 1st Feb, 2019. These Coupon codes are valid till 12AM, 1st Feb, 2019. Every participant can open 5 Realpublic Lucky Bag per day, and the maximum limit for Realpublic Lucky Bag value is ₹1000. Once reaching this limit, participants can still help others open Lucky Bag but won’t be able to get their own Lucky Bag value increased. Realme online store is giving away ₹300 Realme coupon to every registered user before 17th January. This coupon can be used on Realme online store during Realpublic sale days from 20th – 23rd Jan.
All the registered users before 17th Jan will be eligible for an exclusive ₹300 coupon which can be used to make purchases (except Realme accessories) on Realme online store. The users have to visit Realme online store and claim it at 8 AM on 18th January. 10,000 coupons are up for grabs on first come, first serve basis? Moreover, Realme fan can apply coupons won on Realme online store to get additional discount on Realme smartphones. Note: All the coupons won during Realpublic sale days can be used only till 23rd January 23:59 PM. Share this thread with your family and friends and invite them for Realpublic day celebrations with Realme.